I am now settled in to my new apartment. I have a room with a view which is very conducive to writing. This is good because my latest book, 100 American Crime Writers, has just been published by Palgrave Macmillan, and over the next few weeks, I’m going to write several posts on this site to publicise it. As editor of this anthology, I had several wonderful contributors who wrote the biographical entries which comprise the volume. Editing the book was an often arduous, sometimes glorious and ultimately rewarding experience. I often felt like a crime writer, or better still a private detective, piecing together the mystery of these great crime writers’ lives. Several of the contributors have made similar comments to me about the experience. The lives of American crime writers are as fascinating, if not more so, than the work they produced, and the entries balance the discussion between their life and work. If you are a student, scholar of just fan of crime fiction then this is a book for you. From Edgar Allan Poe to James Ellroy, crime writers have provided some of the most popular, controversial, acclaimed and disturbing works in American literature. 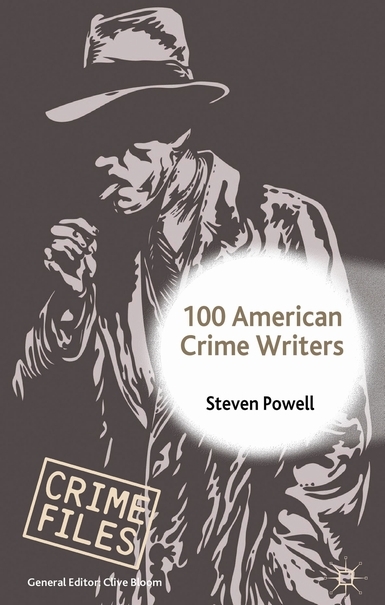 100 American Crime Writers provides critical biographies of some of the greatest and most important crime writers in American history. Both an important scholarly work and an enjoyable read accessible to a wider audience, this addition in Palgrave’s Crime Files series includes discussion of the lives of key crime writers, as well as analysis of the full breadth and scope of the genre – from John Dickson Carr’s Golden Age detective stories to Raymond Chandler’s hardboiled Philip Marlowe novels, Ed McBain’s 87th Precinct police procedurals to Megan Abbott’s modern day reimagining of the femme fatale. Drawing on some of the best and most recent scholarship in the field, all of the key writers and themes of the genre are discussed in this comprehensive study of one of the most fascinating and popular of literary genres. Here’s the page on the publisher’s website, and here is the link for Amazon. Look forward to reading this Steve. Thanks Tony. I’ll do a second edition called 101 American Crime Writers which will include you. Usually books like this are heavy with authors I don’t care about, with the “good ones” far too few. This is the opposite. I only spot a few names I’m not interested in (Janet Evanovich), and mostly gems. Exciting. I hope you enjoy the book. I’m glad you like the diversity of crime writers represented.